Indulge yourselves and book your vacation in this magical place. 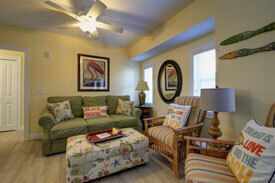 Windsong on the Beach is brand new and just waiting to turn your dream vacation into a reality. Located on the beach side in the beautiful residential district of Indian Shores Beach, Florida. These 2 bedroom 2 bath units each decorated with such exquisite quality and home away from home feel you will find yourself not wanting to leave! This will be your slice of Heaven on earth guaranteed! Access to the Jolly Trolley across the street so a vehicle is not a requirement for enjoyment of what our a real estate has to offer. Dining of all requests are within walking distance. All three units have a distinct personality of their own, portraying the love in which they were built. As you take your virtual tour pick the one that suites your personality the best. All units are accessible by a gradual easy to climb staircase with a luggage lift available on move in and move out days. Galley kitchens are fully stocked and ready to make from the simplest of recipe to a gourmet's delight. Two full bathrooms make getting ready add to the creature comforts these units have to offer. Get ready to snuggle up with your favorite book or movie. Flat screen TV's in living room and bedrooms. Washer and Dryer in units. One parking space per unit with second available by request. All units can be broken up as one bedroom one bath with kitchen - sleeps 4 - 6 depending on floor, one bedroom one bath no kitchen - sleeps 4,or two bedroom two bath - sleeps 8-10 depending on floor, price adjusted accordingly. Click on an image below to see the units in Virtual Reality 3D. "The Sand Between Your Toes"
Get ready to enjoy the Bahamas' Breeze feeling as you enter this unit then exit to the beach where the sand between your toes immediately warms your soul! 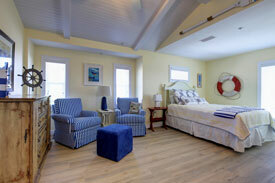 Sleeps 8 - Master Bedroom queen, 2nd bedroom twin trundle, 4 bonus bunk beds. This Key West look alike with its soft color pallet will sooth your inner child right down to the beach where the colors blend into one as you fly, fly, away! 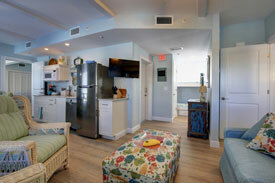 Sleeps 10 - Master Bedroom queen, 2nd bedroom 2 twins, 4 bonus bunks, sleeper sofa. Nautical themed penthouse with bead board vaulted ceilings is bright by day and star struck by night. Enjoy the sunrises, sunsets but the stars are so close you may just be able to touch one as you make your wish! Sleeps 10 - Master Bedroom queen, 2nd bedroom 2 twins, 4 bonus bunks, sleeper sofa. Dedicated In Loving Memory of my parents Pasquale Antonio Civitello & Elvira Vigna Civitello for the legacy of Windsong Farms lives on at Windsong on the Beach. ©2016 Windsong On The Beach. All Rights Reserved.